Aloe vera has been used medicinally in parts of India and Africa for centuries. This miracle plant is known for providing relief for number of skin and hair conditions. The ancient Egyptians used to call aloe vera as a “plant of immortality”. I truly consider aloe vera as a miraculous plant due to its various benefits for the skin hair and health. 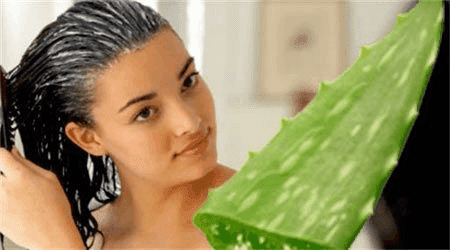 Various studies have been conducted and it has been quite evident that aloe vera plant is helpful in treating a number of skin problems, from flaky to dry skin, sunburn, acne and a lot of hair and scalp related problems too. It contains phytochemicals and other nutrients that make it one of the best natural remedies to be used for the skin and hair. Aloe vera contains vitamins, minerals, amino acid and antioxidants that work wonders for the skin. Aloe vera contains powerful antioxidants that belong to a family of substances known as polyphenols. The presence of polyphenols in aloe vera help to restrict the growth of bacteria on the skin and on the scalp that can cause infections and inflammation. The antimicrobial properties of aloe vera also prevent acne and reduce the redness and inflammation caused by acne. One of the best parts about aloe vera is that it can be used by people of all skin types. These days I’ve been addicted to Aloe Vera, I use it for my hair, for my skin and I even drink it for a better metabolism. I have dry skin and aloe vera acts as a natural moisturizer and and keeps my skin hydrated and also enhances its elasticity. When applied on the skin it releases natural enzymes and essential vitamins that give a deep moisturizing effect to the skin and also restores the pH balance of the skin as well. It also supplies oxygen to the skin which strengthens the skin tissues and makes the skin healthy and soft. Aloe Vera Gel contains two hormones- Auxin and Gibberellins. These two hormones provide wound healing and anti-inflammatory properties that reduce skin inflammation. Gibberellin acts as a growth hormone stimulating the growth of new cells. It also allows the skin to heal quickly and naturally with minimal scarring. Aloe vera contains a plethora of antioxidants including beta carotene, Vitamin C and E that can help improve the skin natural formulas and keeps skin hydrated and younger looking. Use of aloe vera improves skin elasticity and helps to reduce fine lines and wrinkles associated with skin aging. Due to its anti allergic properties it can be used to treat various skin diseases such as eczema, psoriasis and itchy skin. Aloe vera is also very helpful in treating sunburn. Aloe vera due to its wound healing and anti inflammatory properties helps to treat sunburn at the epithelial level of the skin. It also helps to reduce the inflammation and pain caused by sunburn. It works to replenish the skin’s natural moisture and also serves as a protective shield for the skin against further deterioration and enables faster healing of the skin due to the various nutritional qualities and antioxidant properties. Aloe vera gel rejuvenates the skin, hydrates it and keeps the skin looking fresh all the times. It also retains the skin suppleness and elasticity making it an excellent anti aging treatment also. Applying Aloe Vera Gel to your face regularly will help diminish fine lines and wrinkles associated with skin aging . It serves to restore skin’s natural moisture and also acts as a protective barrier against further damage. Aloe vera gel rejuvenates the skin, hydrates it and keeps the skin looking fresh all the times. I have been using aloe vera gel on my skin and on my hair for the past one month and I can see that my hair thickness has increased a bit in the past one month. My skin has also started to feel very soft and supple and has started to look a lot better. I try and use the natural aloe vera gel that has been extracted from the aloe leaf as it is much more effective but if you do not have a aloe vera plant at home you can use the aloe vera gel that is available in the market but please make sure that it is 100% pure aloe vera gel. I would suggest all of you to get a aloe vear plant for yourself because it is a wonder plant and you can prepare so many hair care and skin care diy’s with it that are going to give you amazing results. How to Extract the Gel from the Aloe Vera Leaf? Cut a leaf from the plant with the help of a knife at the base of a plant. Once you cut a leaf you will see a yellow coloured gel will begin to ooze out from the cut. The yellow coloured product that oozes out from the leaf is a sap called aloe latex. Keep the leaf in an upright position and let the latex drain out from the leaf. It will take around 15 minutes. After 15 minutes wash the leaf properly and dry it on a kitchen towel. By this time the sap must have drained completely so lay the leaf flat on a kitchen board and cut the thorny side from the sides of the leaf. With your leaf laying flat on a cutting board, carefully slice away the skin of the aloe vera leaf by running the knife from the centre of the leaf. Now take a spoon and extract the gel by scooping out the gel from the leaf. You can use as many leaves to extract the gel and you can store the gel in the refrigerator for 3-4 days. Aloe Vera contains 75 potentially active constituents: vitamins, enzymes, minerals, sugars, lignin, saponins, salicylic acid and amino acids. Aloe Vera is a miracle plant. It contains Vitamins A(beta carotene), C and E, which are antioxidants. It also contains Vitamin B 12, folic acid and choline. Aloe Vera contains 8 enzymes that help to reduce excessive inflammation when applied to the skin. It provides calcium, chromium, copper, selenium, magnesium, manganese, potassium, sodium and zinc. All these are very important for the proper functioning of the body. It provides 4 plant steroids, all of them have anti-inflammatory action and also possesses antiseptic properties. Aloe Vera contain s 2 powerful hormones: Auxins and Gibberellins that help in wound healing and have anti-inflammatory action. It contains 20 of the 22 human required amino acids and 7 of the 8 essential fatty acids. It contains salicylic acid that possesses anti-inflammatory and anti-bacterial properties. Saponins that are the soapy substance form about 3 % of the gel and have cleansing and antiseptic properties. 1 Tbsp of Aloe Vera Gel. Mix all the ingredients properly and apply on cleansed face with the help of a brush. Leave it to dry completely for atleast 20 minutes. After 20 minutes rinse off with tap water. Honey is an excellent anti aging agent as well as it acts as a great moisturizer. It is loaded with natural antioxidants that have anti-microbial properties that help to fight acne. Cinnamon has anti bacterial, anti fungal and collagen boosting properties that help to cure acne and further helps in skin renewal. 1/2 Tsp of Vitamin E Oil. Mix all the ingredients properly and apply on cleansed face. Let it air dry for 20 minutes. After 20 minutes wash off with lukewarm water. Milk Cream is loaded with minerals and lactic acid which enhances the complexion, it deeply nourishes the skin and also improves the skin texture. Vitamin E is basically an antioxidant which prevents skin aging. Furthermore Vitamin E Oil encourages the production of collagen. Vitamin E moisturizes dry skin and gives it a healthy glow. Mix all the ingredients and mix well. Apply on face and neck and leave it to dry completely. Wash off the face mask once it dries completely. Cucumber Juice is rich in Vitamin K, manganese and beta carotene which is useful for ensuring healthy skin. Cucumber resolves many skin problems and ensures healthy looking skin. Yoghurt contains lactic acid, an alpha hydroxy acid that dissolves dead skin cells. This gentle exfoliation not only helps to create a natural glow and prevent breakouts, but also works to diminish the appearance of fine lines and wrinkles. Mash 1/2 banana and mix in 1 tbsp of aloe vera gel and 1/2 tsp of honey to it. Apply on face and neck and let it dry completely. Banana is rich in powerful anti-oxidants, phytochemicals and moisture. This miraculous fruit will nourish and revitalize dry skin as well as smoothen rough and aging skin. 1 Tsp of Sandalwood Powder. 1 Tsp of Rose Water. Mix all the ingredients well and apply on face and neck. Let it air dry and wash off with normal water. Sandalwood Powder helps in removing sun tan and it gives a fair and glowing complexion. The soothing and cooling properties of sandalwood play a vital role in enhancing the texture of the skin. Rose Water helps maintain the skin’s pH balance and also controls excess oil. Rose water helps to hydrate and moisturize the skin giving it a refreshed look. 1 Tbsp of Gram Flour. Mix all the ingredients properly and apply on face and neck with the help of a brush. Leave it to dry completely and then wash off with normal water. Gram flour or besan has been used since centuries for various skin care remedies. Regular use of besan makes our skin soft and supple and also removes the dead skin layer. Curcumin-one of the most important active compound found in turmeric is an anti-inflammatory, antibacterial, antifungal and antiviral powerhouse that helps the skin to look healthy. Buttermilk is rich in lactic acid which is one of the most powerful alpha hydroxy acid that helps to lighten the skin and make it soft and glowing. Do try all of these face masks recipes. Do let me know your experiences in the comment section and do not forget to share it with your family and friends.